Kansas-Nebraska collegiate ministries are seeing great responsiveness among students this fall. That is what KNCSB staff member Jon Sapp told campus ministry leaders during the annual KNCSB Fall Conference. The Fall Conference was held Sept. 21-23 at Webster Conference Center, Salina, Kan. It is the annual retreat for college students and other young adults. Saturday, Sept. 22, started with the leaders’ meeting. It is an opportunity for them to reconnect with old friends and meet new staff members in collegiate ministries. Twenty different campus groups attended The Fall Conference. 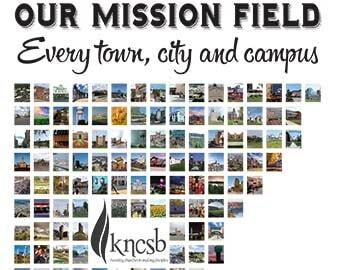 Sapp told about the latest KNCSB campus ministry. A group started in mid-September at Peru State University, Peru, Neb. Colby Community College in northwest Kansas is the home of another new KNCSB campus ministry. Kellan and Taylor Ziegelmeier are the leaders. They are graduates of Fort Hays State University where they were leaders in Christian Challenge. They moved to Colby so Kellan could farm with his family. This new campus group meets on Monday nights at College View Baptist Church. Other campus ministries continue with veteran leaders. Jim and Teri Robinson lead the ministry at Coffeyville Community College, Coffeyville, Kan. They have served in campus ministry for 40 years. The Robinsons came out of the Southern Baptist ministry at Pittsburg State University, Pittsburg, Kan. The Robinsons’ daughter Abby Howe is continuing the family tradition of campus ministry. She and her husband, Brian, lead the group at Barton Community College, Great Bend, Kan.
Forsythe helped students examine what society is telling them about identity. Then he helped them learn how to have a firm, unshakable identity based on a relationship with Jesus. The worship team for The Fall Conference was comprised of worship leaders from several KNCSB campus ministries.